"I want to say thank you from the bottom of my heart! You have put a huge smile on my daughter's face. That is priceless." "Thank you so much for my clarinet. I have been playing for 3 years. It has been fun playing at different events for my school. I am so excited to have my instrument so I can continue playing. 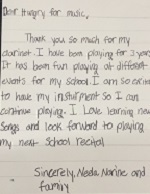 I love learning new songs and look forward to playing my next school recital." "Thank you for your generous and thoughtful contribution to Building a Bridge to Uganda’s Sea Container Project! After several months of travel across the Atlantic and Indian Ocean, the sea container finally arrived at Pope John Paul II High School in a remote village in the heart of Uganda. The musical instruments you donated are going to have a tremendous impact on the lives of our students, many of whom have a natural passion and inclination for music. It’s possible that one of the guitars, trumpets, or flutes could inspire a student to pursue a career as a musician!" It is with deep, deep gratitude that we at Revolution of Hope's Roxbury Youth Orchestra thank you for your generous gift of violins, violas, and cellos to our youth orchestra in Boston's inner city neighborhood of Roxbury. It is no overstatement nor exaggeration to say to you that we could not offer this program to youth in this community without your help." "I know how much music meant to me as a kid growing up: it saved my life! Hungry For Music is doing great and important work, providing free musical instruments to underprivileged kids..."
"Since 2009, Hungry for Music has played a crucial role in bringing IMW's mission to fruition through annual instrument donations. As IMW has grown from serving six to to six hundred students annually, Hungry for Music has been there every step of the way, placing much needed rock band instruments into IMW classrooms across the city, and into the hands of our students through our instrument library so that they can practice at home. We are deeply grateful for the dedication and generosity of Jeff Campbell and his team, and literally could not do what we do without the instruments and equipment they provide. It's inspiring when one stops to think that IMW is just one small part of a much larger national network of instrument support HFM provides. From Appalachia to the inner city, HFM is out there providing thousands with the instruments they need to make music!" "The many instrument donations I have received from Hungry for Music are the heart of my music program at my Head Start - grade 8, high poverty school in Washington, D.C. When I have band class with the older students they play a drum set and bass guitar bass guitar donated by HFM. When we have keyboard practice, some of my 15 classroom keyboards are from HFM, including the Yamaha Clavinova which also doubles as the sound system that I play my laptop through for all my classes. While I have received instruments from other sources as well (Donors Choose & Little Kids Rock) Hungry for Music is the organization that allows me to actually put an instrument in the hands of a talented child and tell them, 'This is yours, to keep forever. Now go home and practice!' I've done this for my star 8th grade guitarist, for a bass guitarist and for 7 keyboard players. This is the stuff of which dreams are made." "I'm very much happy that my students will have an instrument to learn. This is a great help for the future when they are studying in the different universities where they will be enjoying a band scholarship. We are very proud of our Pandan Bay Foundation that here in our province, particularly in our town Pandan, the great musicians still excel through the support of our idol in music the Hungry for Music. More power to you, thank you very much." "There really is no way to put into an e-mail the pure joy we see in Anthony! He was quickly becoming a sullen 13-year-old 8th grader. The boy who had loved school just plain seemed unhappy and more withdrawn. This grandma was very worried.Then you sent the marvelous saxophone. Thank you from the bottom of my heart." "Hungry for Music sent 14 wonderful, brand new violins! What a generous donation! I am so blown away! The kids at the orphanage were SO appreciative and excited to have the violins and to be playing them!" "It has been wonderful working with Jeff Campbell and the folks at Hungry For Music for many years, helping them with their fantastic work. It is so very important for kids to be able to have access to various musical instruments for so many reasons, to foster their creativity and positive growth oriented interactions amongst themselves and their communities"
"Hungry For Music. Who isn't hungry for music? I sure was, as early as I can remember. I was lucky, I had music and instruments in my home, and active music programs all the way through public school. Unfortunately, that kind of access and encouragement is way out of reach for many, many kids today. So now it's up to us to provide kids with the tools they need to stretch there brains and open their hearts with music. A little from us goes a long way. There is strong evidence that a creative life pays dividends to a child in far-reaching ways, let's give them a chance." "I have visited orphanages and hospitals in India, China, Nepal and Ecuador, and Hungry for Music has provided me with a number of instruments we have donated to the children there. Besides giving them all a lot of joy, we are hopeful that some of the recipients will find in music a profession and a way out of poverty. Thanks, Hungry For Music!" "Tyler said it's the most awesome guitar he has ever seen. Feel free to share the picture or use them however you would like to show what a blessing the Hungry for Music program is." "My instructors nearly fell to their knees in gratitude, as we were so short on guitars for this new after-school term, which begins today. They tuned them up and put them in girls' hands literally right out of the boxes! Thank you SO much." "The students who are benefiting from Hungry for Music's instruments range from 5th through 11th grades. Some students have been on our free program's wait list for one or two years, so they are at many different ages when they begin the violin. That being said, it's been a particularly powerful role-modeling experience for our younger students to see 10th and 11th graders leading the way as committed beginners. Even in their first year, many students are already engaged in peer leadership and peer teaching. As they learn new music, they begin to pass it and strengthen their own knowledge by teaching pieces to each other." "By putting musical instruments into hungry hands, Hungry for Music has been donating to Road Recovery large portions of musical instruments (electric guitars, basses, amplifiers, keyboards, drum kits, and more) for several years. With great appreciation, Road Recovery commends Mr. Campbell and Hungry for Music -- showing how two non-profits can provide instruments and musical experiences to young people who would not normally have the opportunity to experience a kind of freedom and self-discovery to overcome adversity." "The instruments are great! The kids love them, the staff loves them. I use them for anxiety relief, anger management and pure enjoyment. I will be bringing a group of folks in soon to do a drum circle to build the confidence of the kids here and show them they can participate actively in joy." "Dear Hungry for Music: I just wanted to say thanks again for all you did in helping my daughter get her sax. Now she now she has been band president for 3 years and awarded outstanding band student for 3 years... Thanks for giving her a chance."